Why did this tax reform bill happen? What do lobbyists do? And how does Lawmker.io want to fix the problem? The tax reform bill making its way through the house and senate is filled with policies that benefit the rich — like formalizing the ability to write off personal jet expenses while students may have to pay income tax on their scholarships. A lot of the legislation in it is because of lobbyists. What do lobbyists do, exactly? Lobbyists petition the government on behalf of special interests. They educate elected officials on key issues. And they’re protected by the constitution. That sounds like a good thing. Why are lobbyists so gross and associated with corruption? They have outsized influence. Only the rich can afford them and get true representation. How does it affect you? What can you do about it? Short answer? Check out Lawmaker.io. Shorter answer? Listen. Politico: Has Trump drained the swamp in Washington? 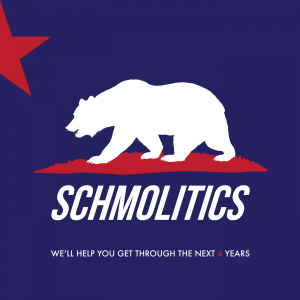 Looking for a quick and easy way to love and support us at Schmolitics? Do a quick rating/review/subscribe on Apple Podcasts! It's how we know you care. ANNNND it really supports us by making us look good, which lets us reach more people. This right here is called a win/win.